Competitive mailshot printing of full colour 16pp A4 marketing cards printed and delivered to Ireland at very competitive prices. 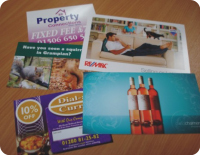 Marketing cards printing at great prices for next day delivery to Ireland. Full colour two sided marketing cards gloss laminate, printed onto 300 gsm gloss art board. Design and artwork. Let our creative design team design you effective professional looking artwork for your marketing cards. Free marketing cards artwork proofing and client area.